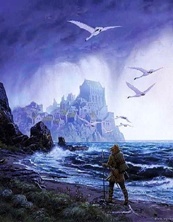 Tuor is Led by the Swans to Vinyamar. Tolkien's marvelous invention of the world of Middle-earth begins with The Silmarillion. In it, Middle-earth is born full of rich, vibrant characters, pulled without a doubt, from the great Nordic myths and tales. The setting of The Silmarillion is the First Age of Tolkien's mythic history, and it is here that the first Dark Lord, Morgoth, comes to Middle-earth and wages war with the High Elves. It is here, also, where we first meet the likes of Elrond and Galadriel when the Elves fight to win back the Silmarils..."the jewels containing the pure light of Valinor." Of The Silmarillion, Tolkien wrote..."the Silmarils are in my heart..." and thus, bespoke his own personal love of the vast work. It is a detailed reading, requiring total concentration and/or, more than one reading, to assimilate this enormous and detailed mythic world. It is, however, well worth the effort. In a nutshell, it is the foundation for all things Tolkien. It sets the stage for all of J.R.R.Tolkien's future writings of Middle-earth, including The Hobbit and The Lord of the Rings. The Quenta Silmarillion: This is the history of the Silmarils (the Jewels) and includes the chapter Of Beren and Luthien..."before Aragorn ever loved Arwen Evenstar, there existed the legend of another mortal, Beren, who against all odds won the heart and hand of the loveliest of elven maids..."
The Akallabeth: This is the story of the downfall of Numenor whose Kings were the ancestors of Aragorn, son of Arathorn, the last of that unbroken bloodline surviving in Middle-earth. © 1977 by George Allen & Unwin (Publishers) Ltd. Images © Ted Nasmith.